All students should call to mind that the practice of the virtue of justice involves paying of one’s debts. All students, whether they are withdrawing, going on a leave of absence, or being ordained are required to have an “exit interview” with the Director of Finance regarding medical insurance and any outstanding accounts in the bookstore, library or canteen. 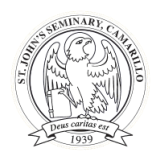 If there are any outstanding debts, St. John’s Seminary reserves the right to deny any transcript services.